For fans not even of the original Stormwatch necessarily, but of Stormwatch's bolder, edgier, more popular sibling The Authority, the title page of the DC New 52's first volume, Stormwatch: The Dark Side, is the realization of all the hope that followed DC Comics's announcement of the revamped title as part of their relaunch. Apollo, Midnighter, the Engineer, Jack Hawksmoor, Jenny Quantum, and randomly yet fittingly Martian Manhunter sit around a table peering at threats to the earth below. Call it what you like -- this is the Authority come to the DC Universe, and that's a good thing even if the concept must necessarily be watered down for mainstream consumption. Writer Paul Cornell succeeds in what feels like a two-hour television pilot for Stormwatch. The story is clumsy at times, accidentally and also in the way Authority had of running at top speed and leaving the reader to keep up and fall behind. There is however great joy in seeing these characters together, and what Stormwatch offers is something that can't be found anywhere else in the DC Universe; those facts alone argue for this title continuing through its second collection and beyond. Cornell brought humor, action, and philosophy to Superman: The Black Ring (starring Lex Luthor, no less), so there was little doubt he could do the same for Stormwatch. But the first few issues of Dark Side clunk along not quite smoothly, and that's troubling for a new title. There's a rather fearsome image of the moon attacking the earth that turns out to be "just a picture," not actually representative of the threat at hand, kind of a tease to the reader. On one hand team members essentially state their powers aloud for no reason other than the writer needs it; on the other, the story starts with babble about an alien horn, a "Moscow mission," and the threat of the moon, with little background for the reader to grab hold of. This second item is less a problem than the too-obvious dialogue. It is not unlike Authority to start in the middle of things, whether a sudden attack by clones or Sliding Albion. But Cornell confuses things when character Adam One asks what "blew" the alien horn, when it's never quite clear that anything played the horn at all nor whether it simply appeared in the Himalayas, crash-landed, or what happened. Moscow and the moon are ultimately cleared up by the end of the issue, and the Stormwatch creative team gets extra points that someone, editor or letterer, uses the classic Wildstorm font for the narration of the moon-beast, an excellent throwback to Stormwatch/Authority of yore. 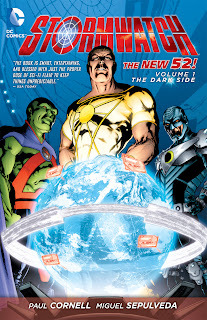 The difficulty with some DC New 52 premieres is that, in an effort to tell one whole story in the collection, the writers double-back over the same plot points; Green Lantern: Sinestro is somewhat guilty of this, as is Justice League International: The Signal Masters. Had The Dark Side dealt with the moon-beast Scourge of Worlds through all six of its issues, it would fall into this category too, but Cornell smartly turns to something completely different for the final two. The murder of the team leader by Stormwatch's ruling Shadow Cabinet, the betrayal of a teammate, and a conflict with the team's own ship packs a lot into the final issues, and makes this book about more, ultimately, than heroes fighting a monster. That a "Shadow Cabinet" runs Stormwatch seems to be a new addition by Cornell to Stormwatch/Authority lore. It is perhaps too much for the reader to hope that this refers at all to the old Milestone Shadow Cabinet title, but it's promising to see Cornell innovate and not feel compelled to follow either Stormwatch or Authority's old rules (to some extent this Stormwatch greater resembles the Authority just as the UN-chartered Justice League International better resembles Wildstorm's old Stormwatch). Also the Authority had captured and tamed their sentient hyperspace headquarters off-screen prior to the series' start, so it's interesting too to see Cornell take up a "lost moment" from Authority to have Jack Hawksmoor and Stormwatch actually have to negotiate terms with their headquarters here and now. Though largely a Doctor Who writer, Cornell has dabbled in Star Trek reading guides, and the end of Stormwatch (especially issue five) is notable because it's a bottle episode (named not in the least for Trek episodes that take place entirely on the ship). DC Comics does not lack for space-faring titles, especially in the last few years, but R.E.B.E.L.S., for instance, had not such a small group of regular characters nor such a distinct headquarters. The Justice League may have a satellite headquarters (had at one point, and might again) but aren't quite right for such cosmic nor character-driven stories. In this way, Stormwatch: The Dark Side represents not just the integration of a major Wildstorm institution into the DC Universe, but also a new kind of title for DC Comics proper, of the kind it may not have ever seen before. The Dark Side does not excel -- like Justice League International, this is a functional story but not until the end does it really begin to do anything different -- but it's a pleasure to see the Authority characters again, and front-and-center and in the DC Universe sandbox. That alone ought be worth even the most cynical reader giving this one another volume to really find its feet. Coming up tomorrow, Wednesday, and Thursday, our guest reviewers take the reigns, with three new Marvel reviews. And next week, two big reviews you won't want to miss -- the Collected Editions review of the DC New 52 Catwoman: The Game and Geoff Johns and Gary Frank's Batman: Earth One. Be here! It's a shame that Cornell left the book just when it started to get really good. His last two issues were so much better than the first four, and they pointed the team toward a very interesting direction. Of all the new titles that were brought in with the reboot I had the most hope for this one. How could you go wrong with Cornell writing Stormwatch/Authority? Unfortunately I think this was another casualty of the reboot being a rush job and it took Cornell a few issues to get into the groove. I agree with shagamu that it was a shame tha he left just when things were improving. Was a reason ever given? This was a collection that I planned on picking up but with a new writer I'm going to wait and see how things play out. 1) the story wasn't bad but just disappointing. The potential to be awesome was there but it was up on the line and never crossed. 2) the art was solid but photoshop effects were really distracting. 3) there wasn't really any reason on why Martian Manhunter was there in the first place. I did read the first issue when it came and I enjoyed it. But it didn't knocked my socks. Maybe this Wednesday, I'll go pick up the trades based on your review. Cornell's a good writing and I've certainly enjoyed The Authority in the past, but I hate the merging of the DCU and Wildstorm. The Authority worked best when it was a brilliant parody of the the DCU. How can it do that from the inside? I still wish J'onn would have been kept into the main JL book, he's always been the Justice League "constant" in my eyes, through all the incarnations. Don't mind me, this new book's still ok, though they could have used Hawkman or Aquaman onboard instead..
@Eyz: I completely agree with you on J'onn being left off the JL. Unfortunately when this Stormwatch book gets canceled, and at some point it will. J'onn will be left to just drift aimlessly. They will probably try to shoehorn him into another title or another team, but I think history has shown that people aren't interested in reading a Martian Manhunter solo title and that his best fit is on the JL. I'm hoping that this series picks up and becomes at least a little bit edgier, but we'll see. DC seems to be playing it very safe at the moment. Also hoping Midnighter loses that stupid chin spike! What I DON'T like about this new Stormwatch, is that its existance retconns Jenny Sparks out of existance, and I adored her. Okay, so she died twelve years ago and it would be impossible to bring her back in any way, but she was easily my favourite character of the original team! Does it necessarily retcon Jenny Sparks out, or have we just not met the "new" Sparks yet? There still must have been a Jenny for every century, right?